Fig. 5. Synapse distribution of cerebral motor cortex in traumatic brain injury model. 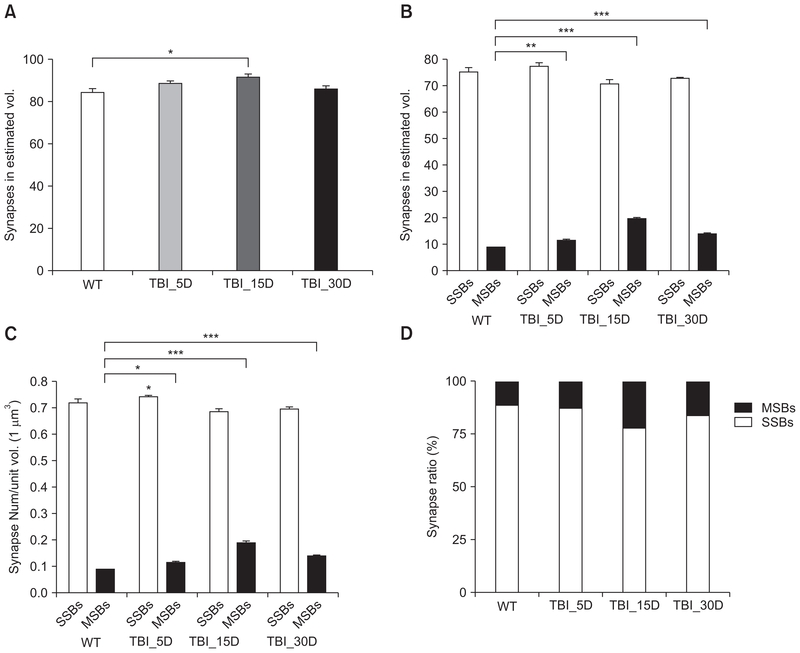 Synapse distribution of WT and TBI mice in cerebral motor cortex layer V. (A) Total number of synapses includes SSBs and MSBs were changed just in after TBI 15 day model (TBI_5D, p=0.0533; TBI_15D, p=0.0330; TBI_30D, p=0.2244; Student t-test). (B) However, estimated number of MSBs were significantly increased in all TBI models (TBI_5D, p=0.0019; TBI_15D, p<0.0001; TBI_30D, p=0.0003; Student t-test). (C) Also, number of MSBs in per unit volume (1 μm3) was significantly different in WT mice and TBI models (TBI_5D, p=0.0019; TBI_15D, p<0.0001; TBI_30D, p=0.0003; Student t-test). (D) Proportion of SSBs and MSBs were showed similar result between WT mice and TBI model analyzed per unit volume. Data are means ± SEM.